We had just begun to stare at the wide array of exotic dishes offered behind the plexi-glass enclosed steam table when he was on us. He wore dark shades and a dark sport jacket. 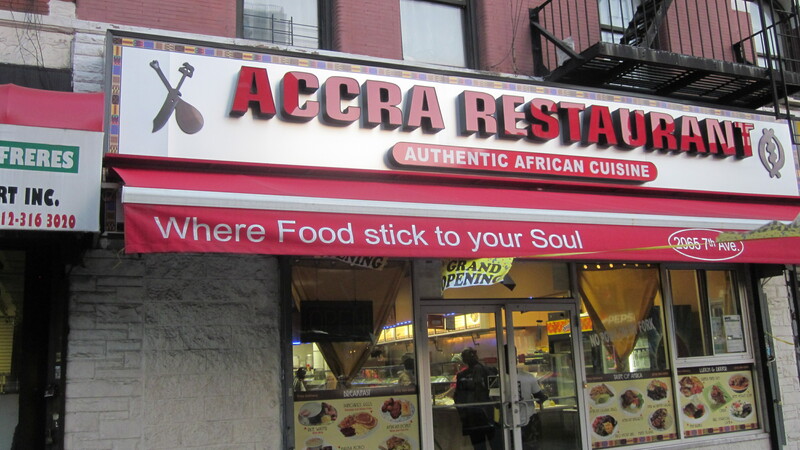 He shoved menus into our hands while proclaiming Accra, the African restaurant Gerry and I had wandered into, as something unlike any other African restaurant. Here, he said, you could get Ghanaian, Senegalese, Nigerian, all kinds of African food. “We even have soul food if you want it,” he said. The assortment was staggering and we had no idea which dishes matched the very vast menu above the steam table. 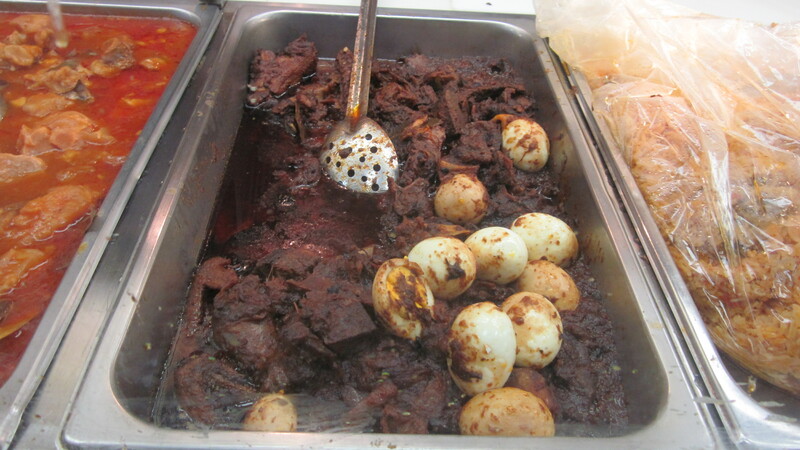 Gerry pointed to a dark brown stew where the only identifiable food were hard boiled eggs. “You want a taste? Give him a taste,” the man in the dark shades said to one of the African women behind the counter. She looked at him quizzically, but no taste was forthcoming. I eyed a rich, forest green vegetable stew. “That’s spinach with meat. Give him a taste,” he said again to the confused woman. “We have beef, lamb, chicken, fish. No pork here,” he added. 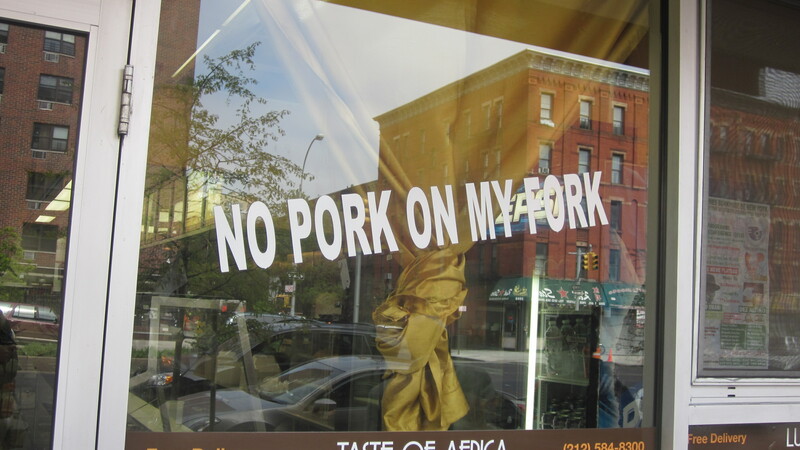 I had noticed the “No Pork on my Fork,” sign on the window in front. It was a remnant from the previous establishment: Mookie’s which I included in a post I wrote on this site called A Little Love for the Pig (Please). Still no love for the pig. “We have peanut soup, jollof rice, fufu, dibi with acheke, wakey with beef…” He said, pointing to the trays as we moved down the assembly line of food. “Give them a taste,” he said again, this time to whomever might listen. But no taste was offered. There were trays of fish. Some just the heads. Others smaller, fried whole. “Tilapia,” he said, pointing to the fish heads. “And whiting,” indicating the smaller, fried fish. Spinach with meat…and tilapia heads. Finally, Gerry and I were handed pieces of the black eyed pea fritters off of small forks. Besides a slight spice tang, they were bland and could use a sauce or condiment as an accompaniment. 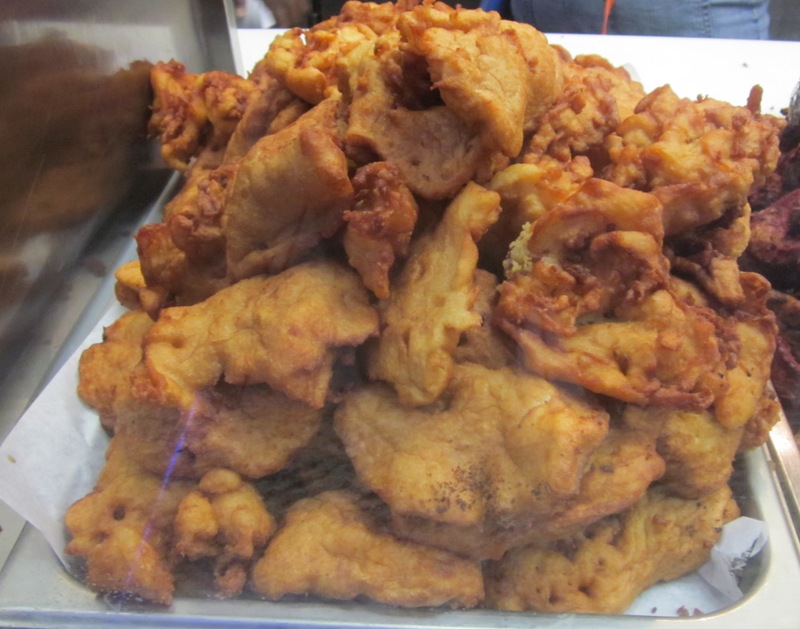 Next to the fritters was a tray that one of the women behind the counter was filling with a pieces of bronzed meat that had just come out of the deep fryer. “What?” I looked closer. They were small, rounded, bony orbs, fried to a reddish brown. I wasn’t sure if I heard correctly. I looked for help from the man in the dark shades, but he had disappeared. We were now on our own at Accra. 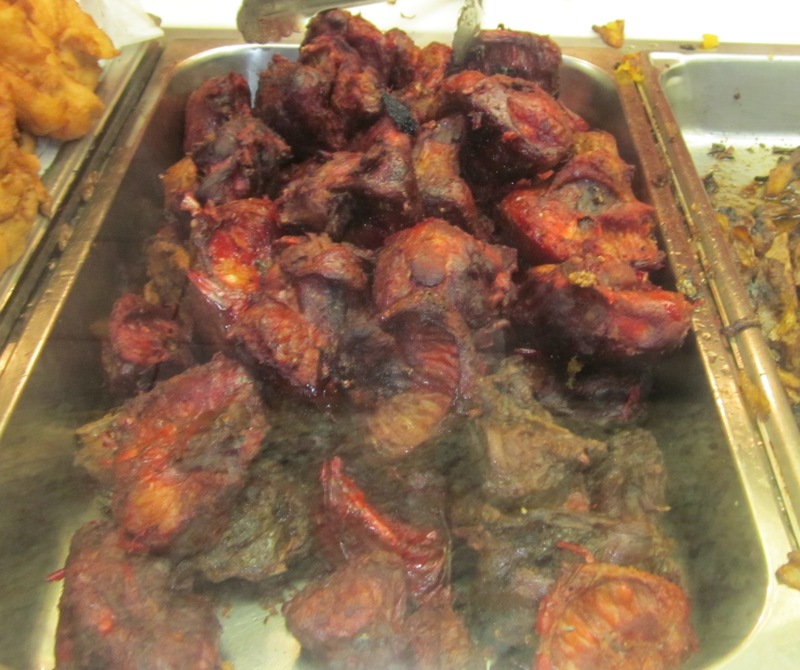 Gerry decided on the dark stew of meats he first noticed along with rice, plantains and the spinach. I tried the sticky okra, jollof rice (a brownish yellow rice with bits of meat), lamb chops and also the spinach. “Let me cut the chops,” the woman assembling my plate said. She cut them with kitchen shears into smaller pieces. 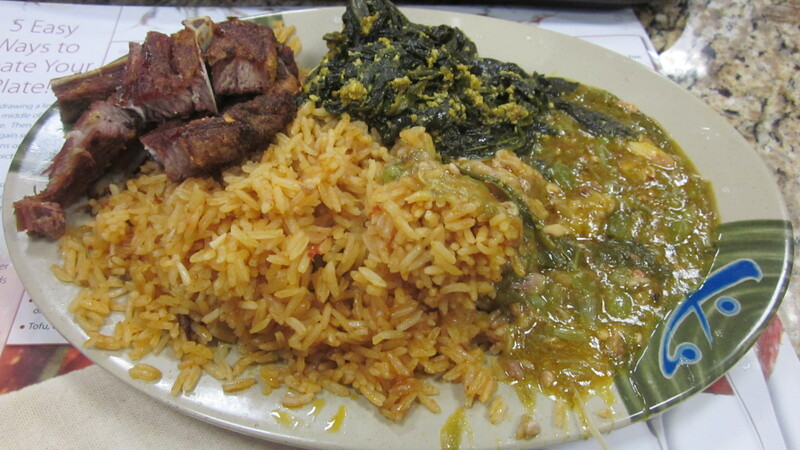 Lamb chops, spinach, okra, and jollof rice. I noticed Gerry had a plastic bottle of homemade ginger beer on his tray. “I’ll take a ginger beer too,” I said, but when I was handed the plastic bottle what was inside had a reddish tinge to it; a different hue than Gerry’s ginger-colored ginger beer. “That’s ginger beer?” I asked. He was assuming that I couldn’t take the heat. That I wasn’t up to the challenge; that my American Caucasian constitution made me physically incapable. I didn’t resent the implication, but neither was I willing to accept it. “Oh no, I’ll have this one,” I insisted stubbornly. I took the food and the ginger beer back to a table where Gerry had already planted himself. Before even starting on the mound of food on my plate, I had to sample the ginger beer. I took a small sip. It was as strong as I’ve ever had; almost like drinking a wasabi smoothie. And after starting in on the very spicy okra and spinach dishes, the ginger beer was offering no respite. I had to cave and order a glass of water to put out the fire. Once the water arrived, I was able to taste the food. Everything was flavorful and lovingly prepared. 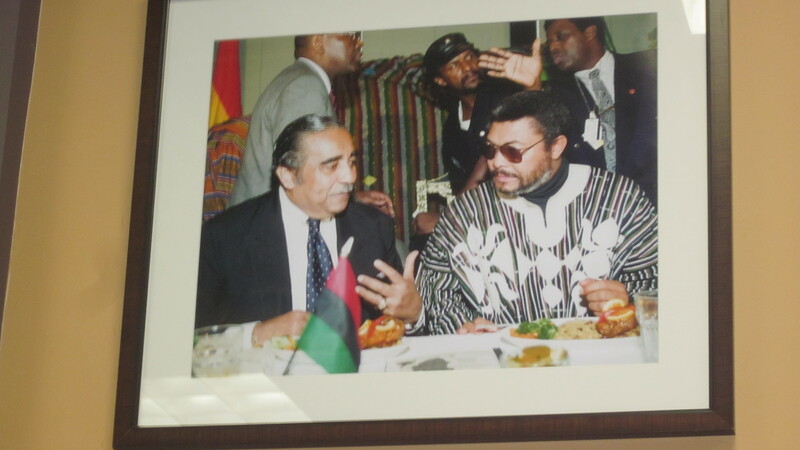 Even the multiple photos of Congressman Charles Rangel wining and dining with African dignitaries could not diminish my appetite. Congressman Rangel sampling jollof rice. Gerry looked around the dining room. “We are the only ones using forks,” he said. I looked up from my plate to see the few occupied tables with men who, using their hands, were scooping their food into their mouth with pieces of pale fufu, familiar from our trip to Jamaica, Queens and the memorable Maima’s (The Bistro that Serves Fufu and Four Fingers), as their only eating utensil. Once our plates were clean, I wondered what there might be for dessert. I noticed Accra carried donuts—the same donuts found at a thousand delis and bodegas across the city. “Not for me,” Gerry said after I suggested it. 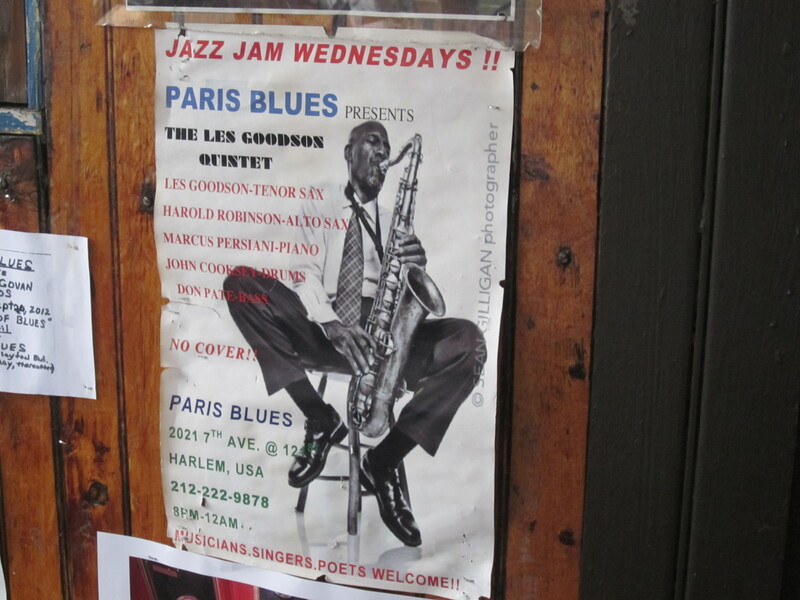 “Paris Blues then,” I said, indicating the bar two blocks away where the Les Goodson band would be performing soon. “Now you’re talking,” Gerry said. We reiterated our praise and said we would be back soon. “Alright then,” He said with a smile and went back into the restaurant. Ghanaian food is almost similar to Nigerian food. 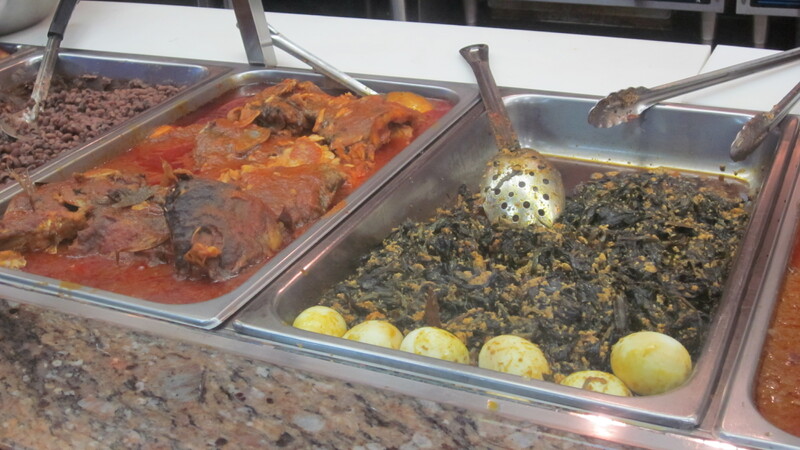 Have you ever been to a Nigerian Restaurant? Try it. I’m on the lookout for Nigerian here in New York. You could try the Buka Restaurant right there in Newyork. I’m there. Is it in the Bronx?